Enameled Copper Wire SWG, Double Cotton Covered Wires, Double Cotton Covered Strips, Double Paper Covered Wires, Double Paper Covered Strips, Lethorid, Printed Circuit Boards, Submersible Cables, Fibre Glass Covered Wires, Fibre Glass Covered Strips, Wire Ropes, Copper Ropes, F Nomex DU Points, H Nomex DU Points, Tinned Coppers, Tinned Copper Fuse Wires, Kraft Paper Itc Makes, Vulcanised Fibre, Crepe Papers, Weidmann Make Board, Weidmann Make Paper, Cork Sheets, polyester Films Garware Make, Solder wire Enamel Removers, Copper Winding Wires, Aluminium Winding Wires, Copper Clad Aluminum Wires, Electric Insulating Materials, Polyster Garwares, Dr Beck Resins Hardener And Varnishes, Dr Beck Resins Hardener, Dr Beck Insulating Varnishes,Enamel Remover, Kraft Paper, P.C.B. 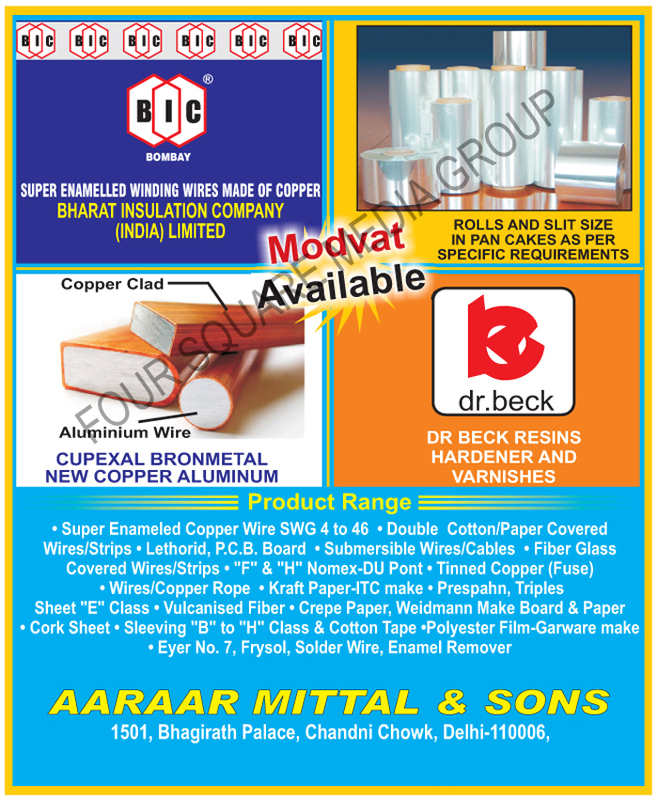 Board, Resins, Solder Wire, Tapes, Cotten Tapes, Winding Wire, Wires, Super Enamelled Winding Wire, Vulcanised Fiber, Fiber Glass Covered Wires, Fiber Glass Covered Strips, Wires Rope, Triples Sheet, Prespahn Sheet, Super Enamelled Copper Winding Wires, Pre Compressed Boards as an active Manufacturer, Supplier, Dealer, Distributor, Trader and Seller etc. (*Importer/Exporter/Service Provider).